A sweet, sticky glaze of quince paste and sherry will perfectly complement the flavours of this traditional Christmas gammon. 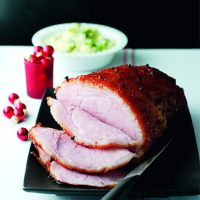 Place the gammon joint in a large pan then pour over the apple juice and enough cold water to cover. Bring to the boil, reduce the heat and cover with a lid. Simmer for 1 hour. Preheat the oven to 180°C, gas mark 4. Drain the gammon thoroughly and allow to cool slightly. Cut the string, then with a small, sharp knife, carefully cut away the rind, leaving the layer of fat intact. Score the fat with a diamond pattern and stud the centre of each with a clove. Place on a rack in a roasting tin, cover loosely with foil and roast for 45 minutes. Meanwhile, place the sherry and quince paste in a small pan and gently heat through until the paste has melted, then simmer for 2-3 minutes. Remove the gammon from the oven and spoon about half the glaze over the top. Pour a little water into the roasting tin to prevent the juices burning. Roast for another 20-25 minutes, then remove from the oven and brush with more glaze. Return to the oven uncovered, until the gammon is golden. If serving hot, allow to stand for 10 minutes before carving into thick slices. Serve with boiled new potatoes and Waitrose Colcannon. before grilling. The gammon also tastes delicious served cold and sliced for a buffet.